Figure 1. Titers of Five Different Antibody Vector Constructs using the CHOgro® Expression System. Five different antibody constructs were produced by transient transfection using TransIT-PRO® at a 1:1 reagent:DNA ratio. Transfections were performed using 1 µg plasmid DNA per milliliter of culture and a cell density of 2 x 106 cells/ml at the time of transfection. FreeStyle™ CHO-S cells were cultured in CHOgro® Expression Medium and seeded into 30 ml media in 125 ml shake flasks (Thomson) for transfection. Day 11 supernatants were clarified and analyzed using a human IgG ELISA (ZeptoMetrix). Error bars represent the standard deviation of triplicate technical replicates. Figure 2. Increases in Product Titer are Observed at Longer Time Points with Mild Hypothermic Conditions. Human IgG1 was produced by transient transfection with the TransIT-PRO® Transfection Reagent and 1 µg plasmid DNA per milliliter of culture at a 1:1 reagent:DNA ratio. Cells were transfected at a density of 2 x 106 cells/ml in 20 ml of CHOgro® Expression Medium in 125 ml shake flasks (Thomson). Antibody levels were also analyzed from day 4, 7 and 11 clarified supernatants using a human IgG ELISA (ZeptoMetrix). All flasks were incubated at 37°C for 24 hours; at that point designated parallel flasks were switched to 32°C for the remainder of the experiment. 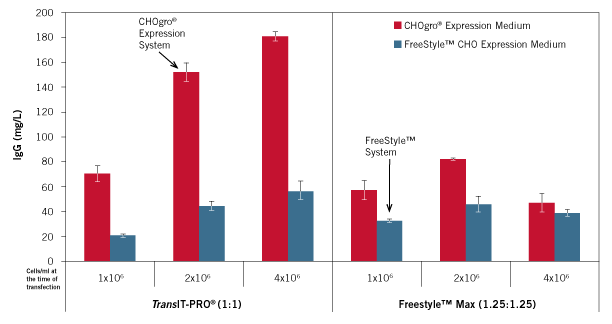 Error bars represent the standard deviation of triplicate technical replicates. Figure 3. Higher Cell Densities Leads to Higher Titers Using the CHOgro® Expression System. 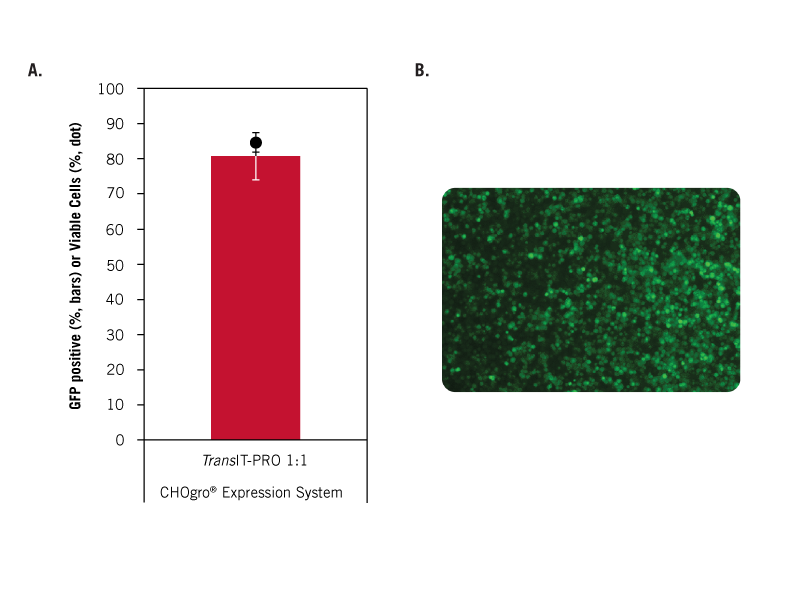 Human IgG1 was produced by transient transfection using TransIT-PRO® (1:1) or FreeStyle™ MAX (1.25:1.25) transfection reagents according to the manufacturers' protocol (reagent:DNA ratio, volume:weight). Transfections were performed using 1 µg plasmid DNA per milliliter of culture and cell densities of 1, 2 or 4 x 106 cells/ml at the time of transfection. FreeStyle™ CHO-S cells were cultured in CHOgro® Expression Medium (red bars) or FreeStyle™ CHO Expression Medium (blue bars) and plated into non-treated 6-well plates (2 ml/well) for transfection. Day 6 supernatants were clarified and analyzed using a human IgG ELISA (ZeptoMetrix). Error bars represent the standard deviation of triplicate technical replicates. More Antibody is Secreted on Per-cell basis With the CHOgro® Expression System. Human IgG1 was produced by transient transfection using TransIT-PRO® (1:1) or FreeStyle™ MAX (1.25:1.25) transfection reagents according to the manufacturers’ protocol (reagent:DNA ratio). Transfections were performed using 1 µg plasmid DNA per milliliter of culture and cell densities of 2 x 106 cells/ml or 1x 106 cells/ml for the CHOgro® or FreeStyle™ System, respectively, at the time of transfection. FreeStyle™ CHO-S cells were cultured in CHOgro® Expression Medium or FreeStyle™ CHO Expression Medium and plated into non-treated 6-well plates (2ml/well) for transfection. 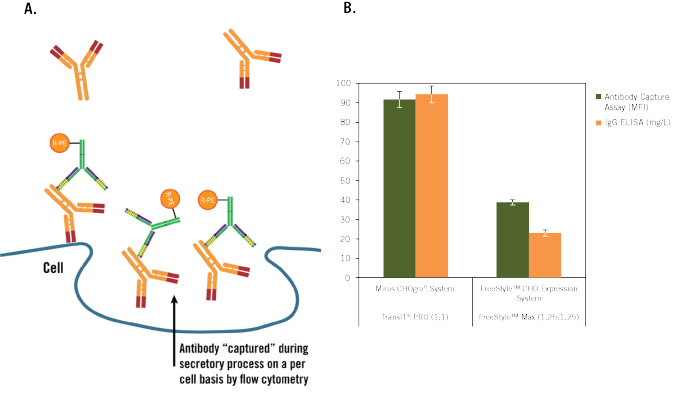 (A) Cells were analyzed using antibody capture. Briefly, an aliquot of cells was washed, incubated with an anti-IgG-PE antibody and blocking agent, washed and assayed for fluorescence. (B) Fluorescence was measured using a Guava easyCyte™ 5HT flow cytometer. Antibody levels were also analyzed from day 6 clarified supernatants using a human IgG ELISA (ZeptoMetrix). Error bars represent the standard deviation of triplicate technical replicates. Figure 5. Suspension CHO Cells Grow to High Density in the CHOgro® Expression Medium. Triplicate flasks of FreeStyle™ CHO-S cells were seeded in CHOgro® Expression Medium (red line) or FreeStyle™ CHO Expression Medium (blue line) at cell density of 0.5 x 106 cells/ml, 40 ml per 125 ml shake flask (Thomson). Cell counts (solid line) and viability (propidium iodide staining, dotted line) were measured daily using a Guava easyCyte™ 5HT flow cytometer (EMD Millipore). 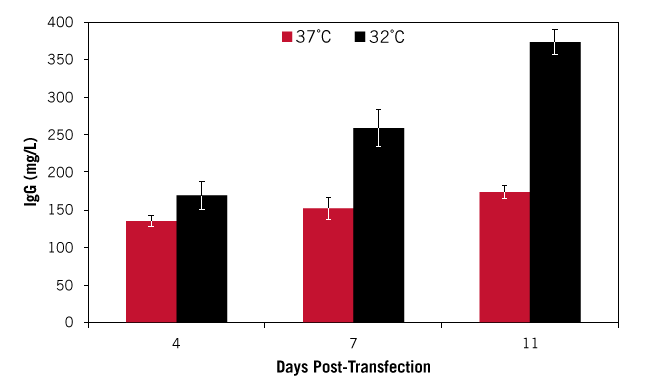 Error bars represent the standard deviation of three readings of biological triplicates. Figure 6. CHOgro® Media Exchange Leads to Higher Protein Production. FreeStyle™ CHO-S cells were cultured in FreeStyle™ CHO Expression Medium or CHOgro® Expression Medium. Twenty four hours prior to transfection a subset of the cells grown in FreeStyle™ CHO Expression Medium were spun down and exchanged with 100% fresh CHOgro® Expression Medium. The cells were allowed to grow and adapt for 24 hours prior to transfection with FreeStyle™ MAX (1.25:1.25) or TransIT-PRO® (1:1) transfection reagents according to the manufacturers’ protocol (reagent:DNA ratio) and a human IgG1 encoding construct. Transfections were performed using 1 µg plasmid DNA per milliliter of culture and cell densities of 1 x 106 cells/ml for cells transfected with FreeStyle™ Max and 2 x 106 cells/ml for cells transfected with TransIT-PRO®. All cells were plated into non-treated 6-well plates (2ml/well) for transfection. (A) Workflow schematic of media exchange of CHO-S cells from FreeStyle™ CHO Expression Medium to CHOgro® Expression Medium (black arrow) or the normal CHOgro® Expression System (red arrow) (B) Day 6 supernatants were clarified and analyzed using a human IgG ELISA (ZeptoMetrix). 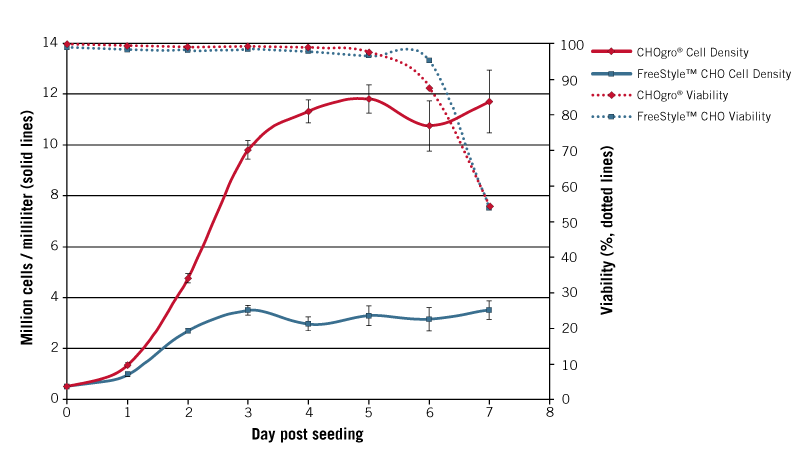 Data is normalized to the complete CHOgro® Expression System (red bar). Error bars represent the standard deviation of triplicate technical replicates. Figure 7. Less Cell Clumping is Observed with the CHOgro® Expression System. 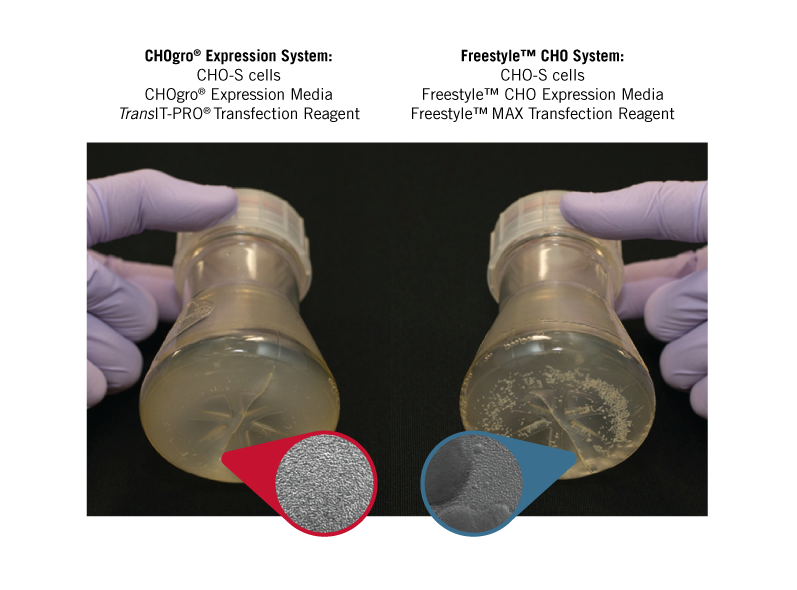 FreeStyle™ CHO-S cells were cultured in CHOgro® Expression Medium or FreeStyle™ CHO Expression Medium and seeded into a 125 ml shake flask (20ml culture volume, Thomson) for transfection. Human IgG1 was produced by transient transfection using TransIT-PRO® (1:1) or FreeStyle™ MAX (1.25:1.25) transfection reagents according to the manufacturers’ protocol (reagent:DNA ratio). Transfections were performed using 1 µg or 1.25 µg plasmid DNA per milliliter of culture and cell densities of 2 x 106 cells/ml or 1x 106 cells/ml for the CHOgro® or FreeStyle™ System, respectively, at the time of transfection. Pictures were taken of representative flasks and cells (inset) 6 days post-transfection. Figure 8. 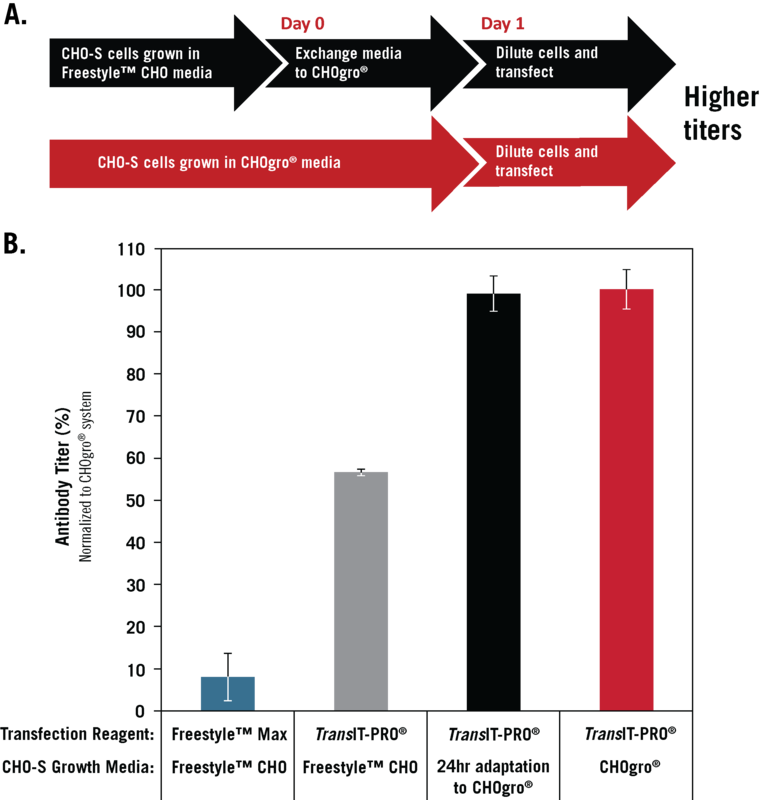 High Efficiency Transfection of CHO-S Cells Using the TransIT-PRO® Transfection Reagent. Human IgG1 was produced by transient transfection using the TransIT-PRO® Transfection Reagent (1:1) (reagent:DNA ratio, volume:weight) using 1 µg plasmid DNA per milliliter of culture and cell a density of 2 x 106 cells/ml in the CHOgro® Expression Medium at the time of transfection. FreeStyle™ CHO-S cells were cultured in CHOgro® Expression Medium and plated into non-treated 6-well plates (2 ml/well) for transfection. (A) GFP levels and cell viability (propidium iodide) were measured 48 hours post-transfection using a Guava easyCyte™ 5HT flow cytometer (EMD Millipore). (B) Images were captured using a Zeiss Axiovert inverted fluorescence microscope.